The State Department of Ecology announced today that it is seeking public input on plans to clean up the North Marina Ameron/Hulbert site on the Everett waterfront. While it began as a lumber mill, the site is probably best known as the location of the Collins Building with its distinctive red and white paint job. The building originally housed the North Coast Casket Company. HistoryLink.org has a great piece on the history of the site from its beginning through the attempts to save the Collins building as the Port of Everett undertook re-development plans. The Washington Department of Ecology encourages the public to comment on draft documents for cleanup work at the North Marina Ameron/Hulbert site in Everett. The comment period starts March 6 and runs through April 7, 2014. Ecology is asking for comments on the draft remedial investigation and feasibility study, which describe contamination at the site and possible cleanup methods. The draft public participation plan describes how Ecology will inform people about the site cleanup and how they can get involved. It also is available for public comment. The North Marina Ameron/Hulbert site near Port Gardner Bay is generally located between 11th and 13th streets, west of West Marine View Drive. It’s southwest of the Legion Memorial Golf Course in western Everett. Operations on the site began in the early 1900s. Primary uses included shingle and saw milling, marine support services, and concrete pole manufacturing. 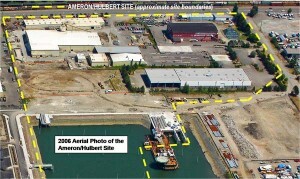 In 1991, the Port of Everett bought the property. The port has used the site to stockpile soil from other port properties. Previous studies showed historic operations at the site contaminated the soil, groundwater and sediment. Contamination includes heavy metals, various chemicals and petroleum-related products. The port did investigations and partial cleanup actions (1991, 1993, 2005-2007) to clean up much of the contaminated soil. The port also did an emergency cleanup of soil contamination in 2011. The draft documents can be reviewed online at Ecology’s website for the North Marina meron/Hulbert site. Ecology’s headquarters at 300 Desmond Drive SE in Lacey. Please contact Carol Dorn for an appointment at 360-407-7224 or Carol.Dorn@ecy.wa.gov. Mail them to Andy Kallus, Department of Ecology, Toxics Cleanup Program, P.O. Box 47600, Olympia, WA 98504-7600. Ecology identified Port Gardner Bay as a high-priority, “early-action” cleanup area under the Puget Sound Initiative. An Ecology team is working with site owners, area tribes and others to clean up 11 Port Gardner sites.